It is all about emotion these days! With the release of Facebook Reactions, Facebook users are now able to more granularly interact with your posts. Couple that with EverTrue, and your team has even deeper insights into how your constituents are engaging with your organization. 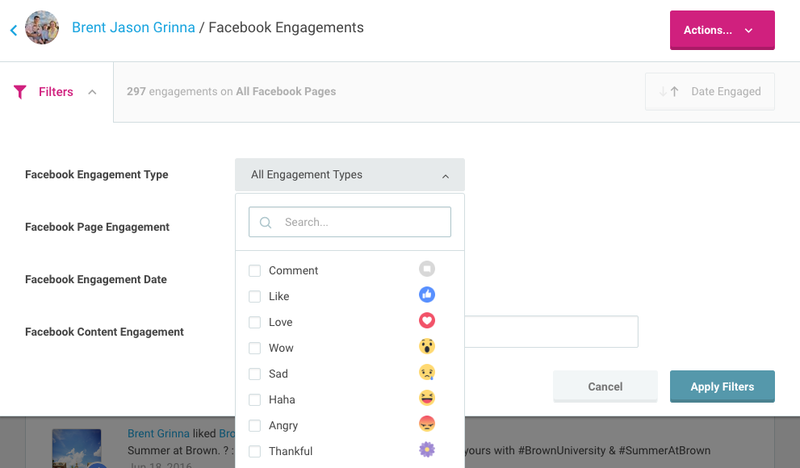 EverTrue's Facebook Reactions filter enables your team to differentiate between Facebook Comments and the seven types of emotive reactions Facebook offers: Like, Love, Wow, Sad, Haha, Angry, and Thankful. 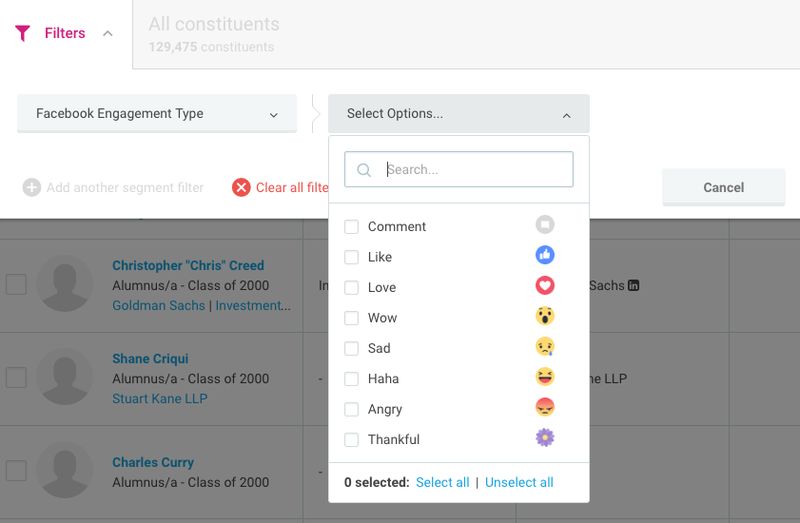 Constituent Filter: Using the search filter "Facebook Engagement Type," select the reactions you are interested in. This filter searches across your entire constituent base. Profile Filter: On a constituent profile, under the engagement tab, select "View All," then apply a "Facebook Engagement Type" filter. This filter searches across all Facebook engagements a particular constituent has had with your institution's Facebook page content. Engagement Filter: In the Facebook Insights tab (located in the left-side main menu), open up the Engagements tab. 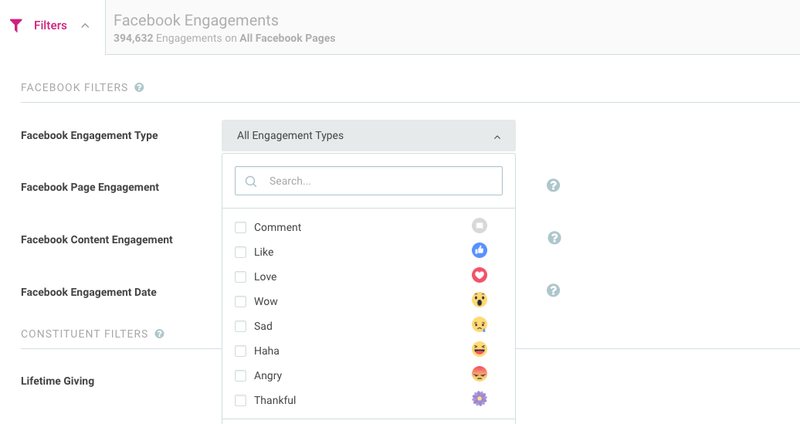 From there, apply the "Facebook Engagement Type" filter, which searches the feed of constituent engagements coming into EverTrue by reaction type. View by Post: In the Facebook Insights tab, each post will display "Matched Constituent Stats." 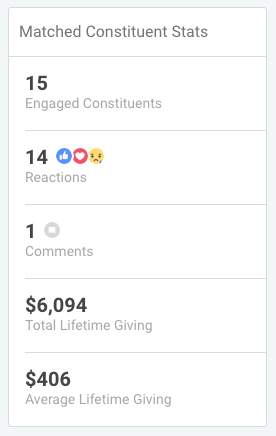 This is where you will see the total number of reactions from all matched constituents for that post.